Doctor Who is a show about giant mannequins attacking people. an alien who travels through time in his time machine, saving the day and being awesome. The Doctor is a Time Lord. He used to live with other Time Lords, but then the Daleks came and killed them all and destroyed his home planet. So now he basically just hangs out in the TARDIS and saves the day and makes friends, who eventually leave in some depressing manner. The Doctor can regenerate if he is close to death. So far, the tenth regeneration has been the most awesome. Others may disagree, but I do not care. During his travels, the Doctor makes friends with some of the people he saves. Many of these choose to travel with him in the TARDIS, until they leave/die in some awful turn of events. The most recent of these companions has been Clara Oswald. Donna Noble was the best companion because she was amazing and fantastic and incredibly witty/funny, along with absorbing and creating a new Doctor, while becoming an awesome DoctorDonna herself. She is much cooler than certain people who just LEFT because the Doctor didn't LOVE THEM (*cough* Martha Jones *cough*), or certain people who somehow got stranded in an alternate universe, so they had to live the rest of their life with the said new/fake version of the Doctor (*cough* Rose Tyler *cough*). Also there was Captain Jack Harkness, who went on to immortal awesomeness as leader of the Torchwood team and the Face of Boe. But he's...well...different. 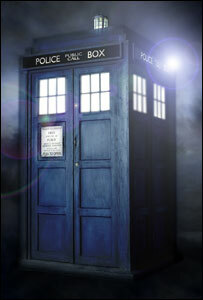 The TARDIS is the Doctor's trusty time-travelling box. It's bigger on the inside. The Doctor stole it from Gallifrey before the Time War and went off to see the Universe. Unfortunately, he broke the disguising mechanism, called the Chameleon Circuit, so now the TARDIS is stuck on "Old-timey police call box" mode. However, this allows for instant identification, as well as giving rise to the color, "TARDIS blue." It is the last TARDIS in existence. The Vashta Nerada, who are teeny-tiny little critters who look like shadows, but will strip your bones clean in like 0.000000001 nanoseconds. The main symptom of a Vashta Nerada outbreak is having two shadows. The Daleks. These are a very deadly species. They shoot electric death rays at you, causing you to die. The Daleks look like a blobby, single-eyed octopus who was encased in a giant salt shaker with a toilet plunger and a whisk. The Cybermen. These robot humanoids, who have ink blots for eyes and retarded handlebars on their heads, are humans that have been made robotic. They like to delete people and/or make them into one of their own in factories using scissors and metal bowls. The Master. He is a time lord, just like the doctor, however he is like 84.38% more evil. He likes to team up with other monsters to take over worlds and stuff. So original. The Silurians. They are reptilian monster thingies who apparently lived on the Earth before being pushed underground for some reason and now they are MAAAADDD!1!! !1 They also have the power to harness dinosaurs which is pretty cool. My Ex-girlfriend. By far the scariest monster in all the series. She has 5 arms and giant teeth. She has laser eyes and a gun in her hand which can pew-pew you to death and also is smelly. Yeah. Definitely. There are many more monsters, however I do not want to list them all. Since Doctor Who is such a fantastic show, it has many fans. These fans (called Whovians, not Whonies) are split into several different categories, which are listed below, for anyone who actually cares. Firstly, fans differ over which Doctor is the best. Purists argue that "It's the SAME DOCTOR, just a different regeneration!" These people have no life, and we apologize for their existence. Secondly, there is much arguing over which companions were the best. The answer, of course, is Donna Noble. Sadly, many people do not think so. The second best, of course, is Rose Tyler. Lastly, there is the much broader "Old Who/New Who" dispute. Many who have been devoted followers of the show for years prefer the older version of the show. Fans who started watching in 2005 generally prefer the newer version. The show is currently being written by Steven Moffat, which means that the show has a rather dark atmosphere. The old writer, Russel T Davies, wasn't much better. He was very melodramatic, which ruined some very good plotlines. Oh well. This page was last edited on 7 Aym 2018, at 12:54.